Walt Disney 5 December 1901 15 December 1966 American Elias Disney Flora Call Disney Screenwriter, Film producer, Dubbing, Television producer, Voice Actor, Film Editor, Entrepreneur, Film director, Entertainer, Presenter, Animator, Businessperson Co-founded Walt disney Productions with his brother Roy, which became one of the best-known motion picture production companies in the world. 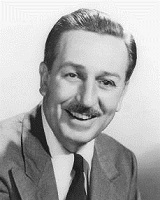 He was an innovative animator and created the cartoon character Mickey Mouse. A list of popular walt disney quotes are given below.